The remainder of this chapter describes some relevant terms and the feature store configuration files in detail. You can access this configuration level by clicking feature stores in the service console. The corresponding resource configuration files are located in subdirectory datasources/feature/ of the active deegree workspace directory. Features are abstractions of real-world objects, such as rivers, buildings, streets or state boundaries. They are the geo objects of a particular application domain. A feature types defines the data model for a class of features. For example, a feature type River could define a class of river features that all have the same properties. All deegree feature stores support simple feature types, but only the SQL feature store and the memory feature store support rich feature types. The SQL feature store or the memory feature store can be used with GML application schemas. The shape feature store serves a feature type from an ESRI shape file. It is currently not transaction capable and only supports simple feature types. The mapping between the shape file columns and the feature type properties is customized. 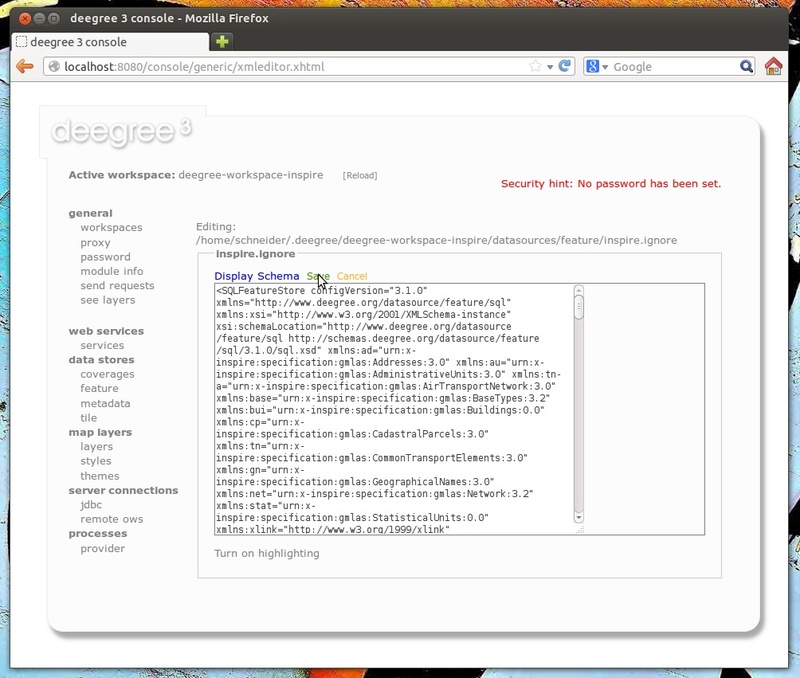 The configuration format for the deegree shape feature store is defined by schema file http://schemas.deegree.org/datasource/feature/shape/3.1.0/shape.xsd. The following table lists all available configuration options. When specifiying them, their order must be respected. 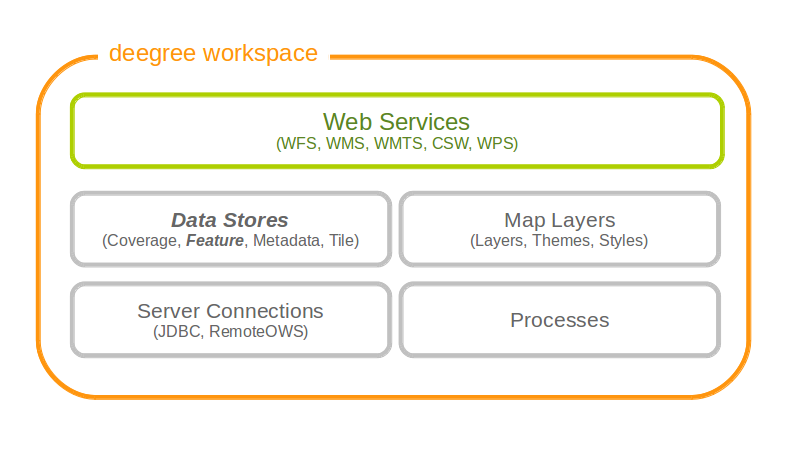 The memory feature store serves feature types that are defined by a GML application schema and are stored in memory. It is transaction capable and supports rich GML application schemas. 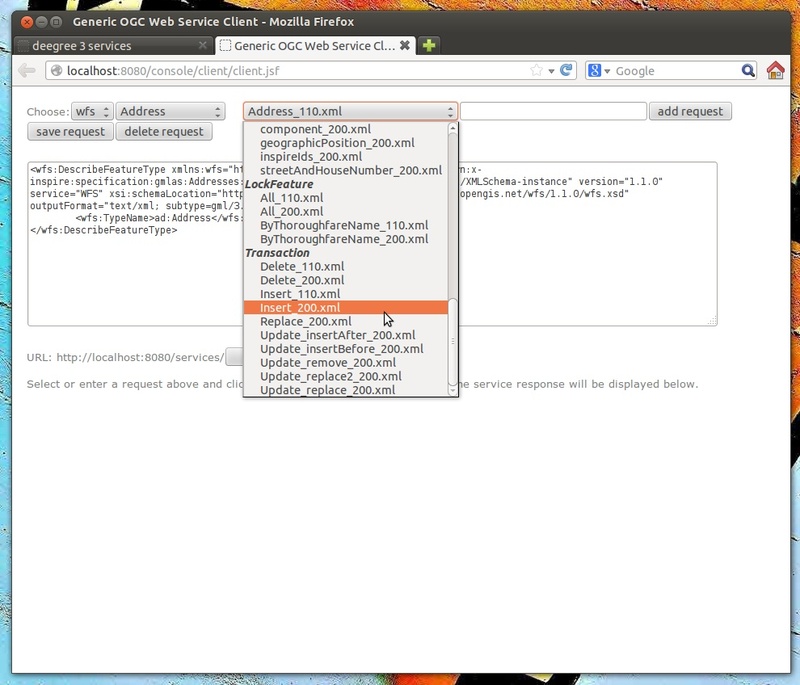 Directory ../../appschemas/inspire/annex1/ is scanned for *.xsd files. All found files are loaded as a GML 3.2 application schema (i.e. analyzed for feature type definitions). Dataset file ../../data/gml/address.gml is loaded on startup. This must be a GML 3.2 file that contains a feature collection with features that validates against the application schema. Dataset file ../../data/gml/parcels.gml is loaded on startup. This must be a GML 3.2 file that contains a feature collection with features that validates against the application schema. The geometries of loaded features are converted to urn:ogc:def:crs:EPSG::4258. The configuration format for the deegree memory feature store is defined by schema file http://schemas.deegree.org/datasource/feature/memory/3.0.0/memory.xsd. The following table lists all available configuration options (the complex ones contain nested options themselves). When specifiying them, their order must be respected. The simple SQL feature store serves simple feature types that are stored in a spatially-enabled database, such as PostGIS. However, it’s not suited for mapping rich GML application schemas and does not support transactions. If you need these capabilities, use the SQL feature store instead. If you want to use the simple SQL feature store with Oracle or Microsoft SQL Server, you will need to add additional modules first. This is described in Adding database modules. 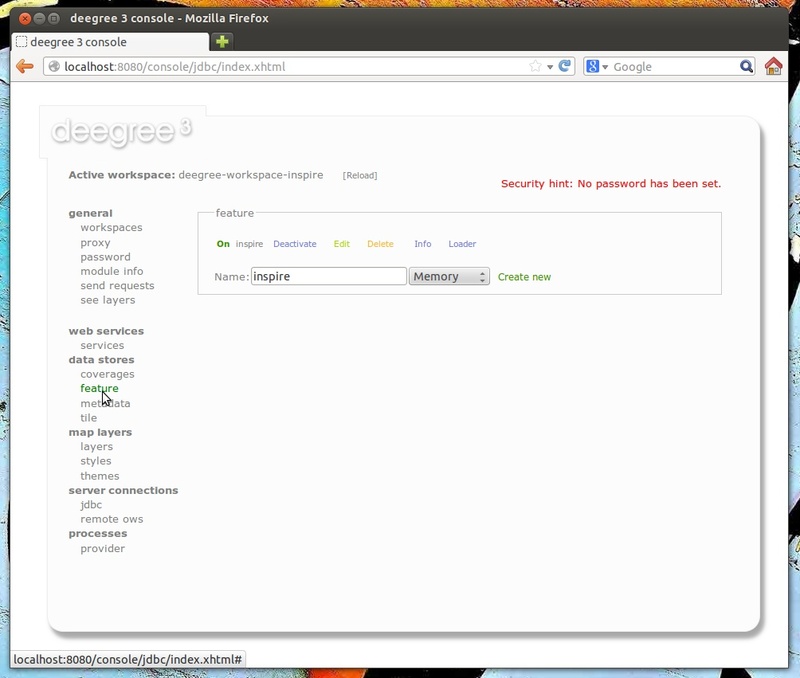 The configuration format is defined by schema file http://schemas.deegree.org/datasource/feature/simplesql/3.0.1/simplesql.xsd. The following table lists all available configuration options (the complex ones contain nested options themselves). When specifiying them, their order must be respected. If you want to use the SQL feature store with Oracle Spatial or Microsoft SQL Server, you will need to add additional modules first. This is described in Adding database modules. <Join table="ad_address_ad_locator" fromColumns="attr_gml_id" toColumns="parentfk" orderColumns="num"
<Join table="ad_address_ad_component" fromColumns="attr_gml_id" toColumns="parentfk" orderColumns="num"
The usage of these options and their sub-options is explained in the remaining sections. A single configuration file may map more than one table. The following example defines two feature types, based on tables country and cities. The order of child elements <Primitive> and <Geometry> is not restricted. They may appear in any order. These options and their sub-options are explained in the following subsections. By default, the name of a mapped feature type will be derived from the table name. If the table is named country, the feature type name will be app:country (app=http://www.deegree.org/app). The name attribute allows to set the feature type name explicity. In the following example, it will be app:Land (Land is German for country). By default, values for the feature id (gml:id attribute in GML) will be based on the primary key column of the mapped table. Values from this column will be prepended with a prefix that is derived from the feature type name. For example, if the feature type name is app:Country, the prefix is APP_COUNTRY. The feature instance that is built from the table row with primary key 42 will have feature id APP_COUNTRY42. Technically, the feature id prefix is important to determine the feature type when performing queries by feature id. Every <FeatureTypeMapping> must have a unique feature id prefix. The former section assumed a mapping configuration that didn’t use a given GML application schema. If a GML application schema is available and specified using <GMLSchema>, the mapping possibilities and available options are extended. We refer to these two modes as table-driven mode (without GML schema) and schema-driven mode (with GML schema). 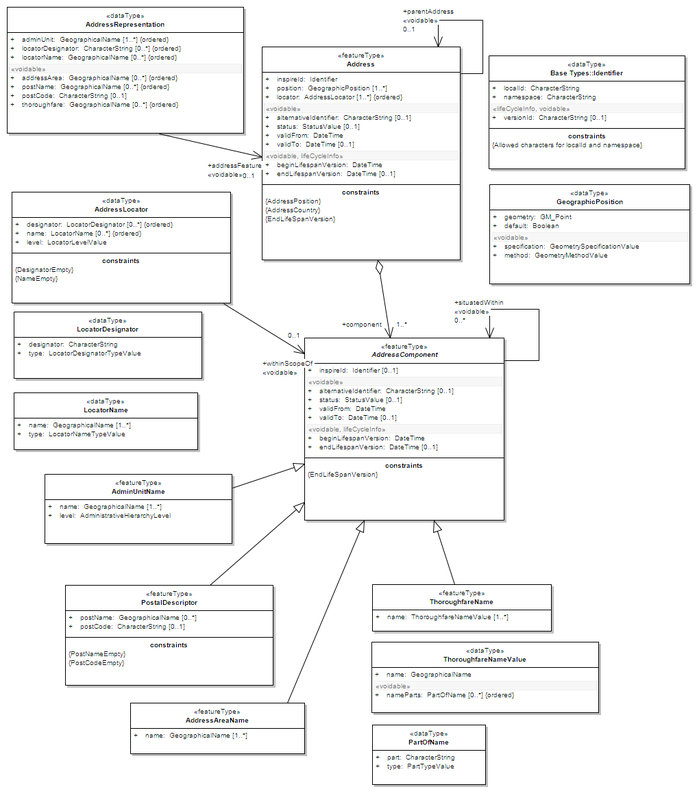 If you want to create a relational mapping for an existing GML application schema (e.g. INSPIRE Data Themes, GeoSciML, CityGML, XPlanung, AAA), always copy the schema files into the appschemas/ directory of your workspace and reference the schema in your configuration. This section assumes that you already have an existing database that you want to map to a GML application schema. If you want to derive a database model from a GML application schema, see Auto-generating a mapping configuration and tables. Manually creating a mapping for a rich GML application schema may appear to be a dauting task at first sight. Especially when you are still trying to figure out how the configuration concepts work, you will be using a lot of trial-and-error. Here are some general practices to make this as painless as possible. Map one property of a feature type at a time. Use the Reload link in the services console to activate changes. After changing the configuration file, make sure that the status of the feature store stays green (in the console). If an exclamation mark occurs, you have an error in your configuration. Check the error message and fix it. Use the services console to auto-generate a mapping configuration (see Auto-generating a mapping configuration and tables). It should reflect the structure and datatypes correctly. Auto-generate the mapping, create a copy of the file and start with a minimal version (FeatureTypeMapping by FeatureTypeMapping, property by property). Adapt it to your own database tables and columns and remove optional elements and attributes that you don’t want to map. Use the deegree support options (mailing lists, commercial support) to get help. 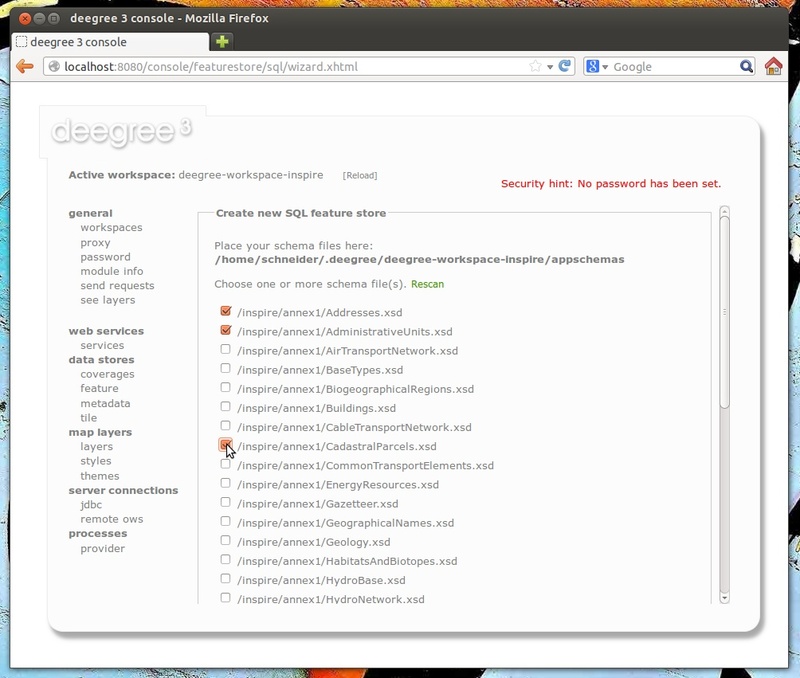 The deegree project aims for a user-interface to help with all steps of creating mapping configurations. If you are interested in working on this (or funding it), don’t hesitate to contact the project bodies. The order of child elements <Primitive>, <Geometry>, <Complex> and <Feature> is not restricted. They may appear in any order. In schema-driven mode, there is no automatic detection of columns, column types or primary keys. You always have to specify <FIDMapping>. There are several things to observe here. The Complex element occurs twice. In the path attribute of the first occurrence, we specified the qualified name of the (complex) property we want to map (ad:inspireId). The nested Complex targets child element base:Identifier of ad:inspireId. And finally, the Primitive elements specify that child element base:localId is mapped to column localid and element base:namespace is mapped to constant NL.KAD.BAG (note the single quotes around NL.KAD.BAG). The first child element of a <Complex> (or <Primitive>, <Geometry> or <Feature>) can be <Join>. <Join> performs a table change: table rows corresponding to ad:position are not stored in the root feature type table (ad_address), but in a joined table. All siblings of <Join> (or their children) refer to this joined table (ad_address_ad_position). The join condition that determines the related rows in the joined table is ad_address.fid=ad_address_ad_position.fk. <Join> is described in detail in the next section. Valid expressions for path can also be . (current node) and text() (primitive value of the current node). Let’s move on to the mapping of property ad:component. This property can occur multiple times and contains (a reference to) another feature. As in the mapping of ad:position, a <Join> is used to change the table context. The table that stores the information for ad:component properties is ad_address_ad_component. The <Feature> declares that we want to map a feature-valued node and it’s <Href> sub-element defines that column href stores the value for the xlink:href. At the beginning of a <FeatureTypeMapping>, the current table context is the one specified by the table attribute. In the following example snippet, this would be table ad_address. Note that all mapped columns stem from table ad_address. This is fine, as each feature can only have a single gml:identifier property. However, when mapping a property that may occur any number of times, we will have to access the values for this property in a separate table. In this example, property gml:identifier is mapped as before (the data values stem from table ad_address). In contrast to that, property ad:position can occur any number of times for a single ad_address feature instance. In order to reflect that in the relational model, the values for this property have to be taken from/stored in a separate table. The feature type table (ad_address) must have a 1:n relation to this table. The <Join> element is used to define such a change in the table context (in other words: a relation/join between two tables). A <Join> element may only occur as first child element of any of the mapping elements (<Primitive>, <Geometry>, <Feature> or <Complex>). It changes from the current table context to another one. In the example, the table context in the mapping of property ad:position is changed from ad_address to ad_address_ad_position. All mapping instructions that follow the <Join> element refer to the new table context. For example, the geometry value is taken from ad_address_ad_position.ad_geographicposition_ad_geometry_value. table 1..1 String Name of the target table to change to. fromColumns 1..1 String One or more columns that define the join key in the source table. toColumns 1..1 String One or more columns that define the join key in the target table. orderColumns 0..1 String One or more columns hat define the order of the joined rows. numbered 0..1 Boolean Set to true, if orderColumns refers to a single column that contains natural numbers [1,2,3,...]. <AutoKeyColumn> 0..n Complex Columns in the target table that store autogenerated keys (only required for transactions). Attributes fromColumns, toColumns and orderColumns may each contain one or more columns. When specifying multiple columns, they must be given as a whitespace-separated list. orderColumns is used to force a specific ordering on the joined table rows. If this attribute is omitted, the order of joined rows is not defined and reconstructed feature instances may vary each time they are fetched from the database. In the above example, this would mean that the multiple ad:position properties of an ad:Address feature may change their order. In case that the order column stores the child index of the XML element, the numbered attribute should be set to true. In this special case, filtering on property names with child indexes will be correctly mapped to SQL WHERE clauses as in the following WFS example request. In the above example, only those ad:Address features will be returned where the geometry in the third ad:position property has an intersection with the specified bounding box. If only other ad:position properties (e.g. the first one) matches this constraint, they will not be included in the output. The <AutoKeyColumn> configuration option is only required when you want to use transactions on your feature store and your relational model is non-canonical. Ideally, the mapping will only change the table context in case the feature type model allows for multiple child elements at that point. In other words: if the XML schema has maxOccurs set to unbounded for an element, the relational model should have a corresponding 1:n relation. For a 1:n relation, the target table of the context change should have a foreign key column that points to the primary key column of the source table of the context change. This is important, as the SQL feature store has to propagate keys from the source table to the target table and store them there as well. If the joined table is the origin of other joins, than it is important that the SQL feature store can generate primary keys for the join table. If not configured otherwise, it is assumed that column id stores the primary key and that the database will auto-generate values on insert using database mechanisms such as sequences or triggers. In this example snippet, the primary key for table B is stored in column pk1 and values for this column are generated using the UUID generator. There’s another change in the table context from B to C. Rows in table C have a key stored in column parentfk that corresponds to the B.pk1. On insert, values generated for B.pk1 will be propagated and stored for new rows in this table as well. The following table lists the options for <AutoKeyColumn> elements. Inside a <AutoKeyColumn>, you may use the same key generators that are available for feature id generation (see above). An alternative approach to mapping each feature type from an application schema using <FeatureTypeMapping> is to specify a single <BLOBMapping> element. This activates a different storage strategy based on a fixed database schema. Central to this schema is a table that stores every feature instance (and all of it’s properties) as a BLOB (binary large object). In order for <BLOBMapping> to work, you need to have the correct tables in your database and initialize the feature type table with the names of all feature types you want to use. We recommend not to do this manually, see Auto-generating a mapping configuration and tables. The wizard will also create suitable indexes to speed up queries. You may wonder how to get data into the database in BLOB mode. As for standard mapping, you can do this by executing WFS-T requests or by using the feature store loader. 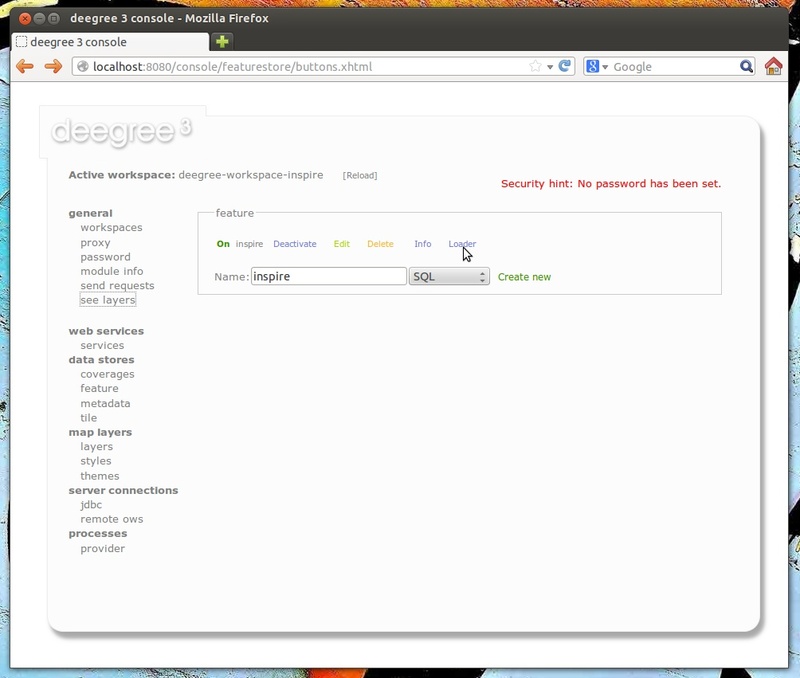 Its usage is described in the last steps of Auto-generating a mapping configuration and tables. In BLOB mode, only spatial and feature id queries can be mapped to SQL WHERE-constraints. All other kinds of filter conditions are performed in memory. See Evaluation of query filters for more information. However, there’s a caveat for inserts: The SQL feature store has to know how to obtain new and unique feature ids. 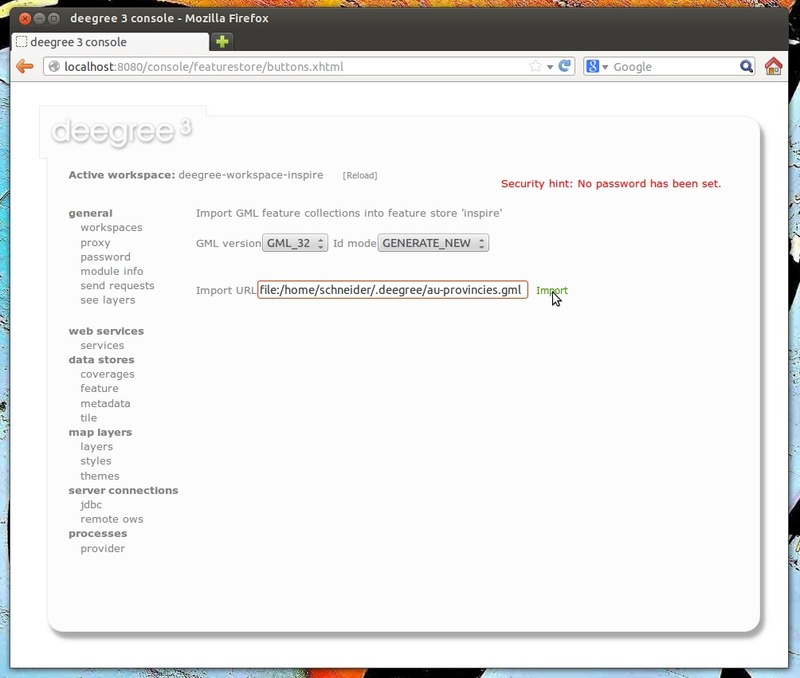 UseExisting: The feature store will use the original gml:id values that have been provided in the input. This may lead to errors if the provided ids are already in use or if the format of the id does not match the configuration. GenerateNew: The feature store will discard the original gml:id values and use the configured generator to produce new and unique identifiers. References in the input (xlink:href) that point to a feature with an reassigned id are fixed as well, so reference consistency is ensured. ReplaceDuplicate: The feature store will try to use the original gml:id values that have been provided in the input. If a certain identifier already exists in the database, the configured generator is used to produce a new and unique identifier. NOTE: Support for this mode is not implemented yet. In a WFS 1.1.0 insert request, the id generation mode is controlled by attribute idGenMode. WFS 1.0.0 and WFS 2.0.0 don’t support to specify it on a request basis. 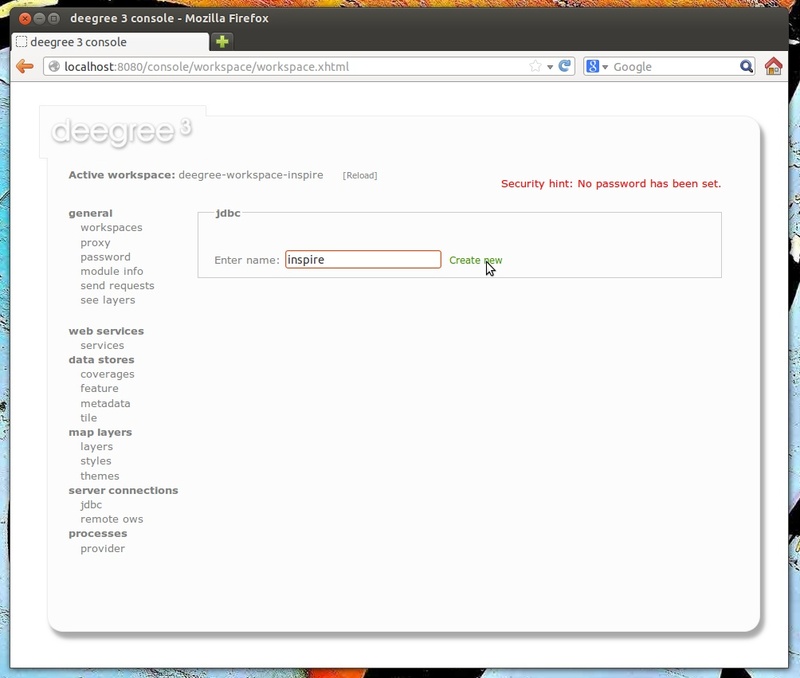 However, in the deegree WFS configuration you can control it in the option EnableTransactions. The auto id generator depends on the database to provide new values for the feature id column(s) on insert. This requires that the used feature id columns are configured appropriately in the database (e.g. 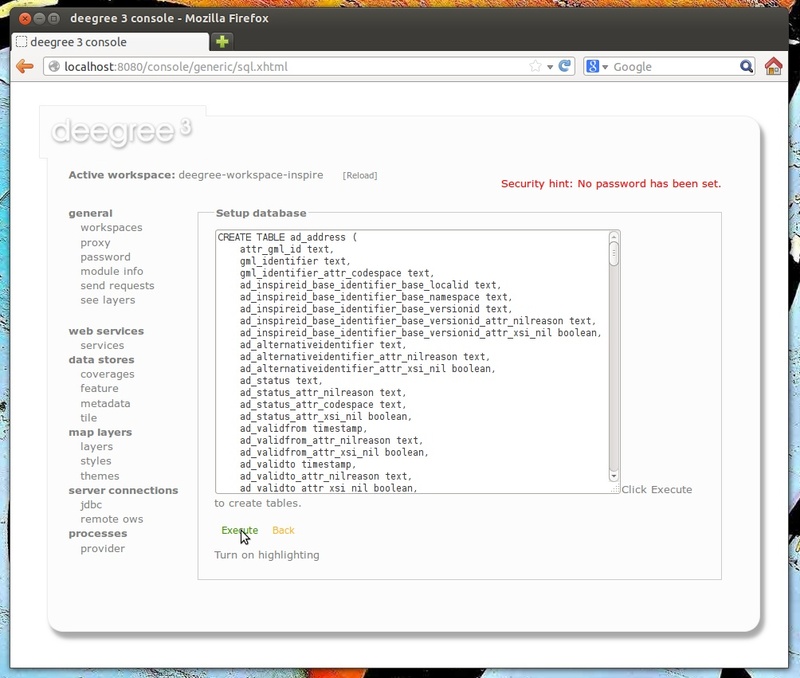 that they have a trigger or a suitable column type such as SERIAL in PostgreSQL). When querying, the prefix AD_ADDRESS_ is prepended to column attr_gml_id to create the exported feature id. If attr_gml_id contains the value 42 in the database, the feature instance that is created from this row will have the value AD_ADDRESS_42. On insert (mode=UseExisting), provided gml:id values must have the format AD_ADDRESS_$. The prefix AD_ADDRESS_ is removed and the remaining part of the identifier is stored in column attr_gml_id. On insert (mode=GenerateNew), the database must automatically create a new value for column attr_gml_id which will be the postfix of the newly assigned feature id. The UUID generator generator uses Java’s UUID implementation to generate new and unique identifiers. This requires that the database column for the id is a character column that can store strings with a length of 36 characters and that the database does not perform any kind of insertion value generation for this column (e.g triggers). When querying, the prefix AD_ADDRESS_ is prepended to column attr_gml_id to create the exported feature id. If attr_gml_id contains the value 550e8400-e29b-11d4-a716-446655440000 in the database, the feature instance that is created from this row will have the value AD_ADDRESS_550e8400-e29b-11d4-a716-446655440000. On insert (mode=GenerateNew), a new UUID is generated and stored in column attr_gml_id. The sequence id generator queries a database sequence to generate new and unique identifiers. This requires that the database column for the id is compatible with the values generated by the sequence and that the database does not perform any kind of automatical value insertion for this column (e.g triggers). On insert (mode=GenerateNew), the database sequence SEQ_FID is queried for new values to be stored in column attr_gml_id. The SQL feature store always tries to map filter conditions (e.g. 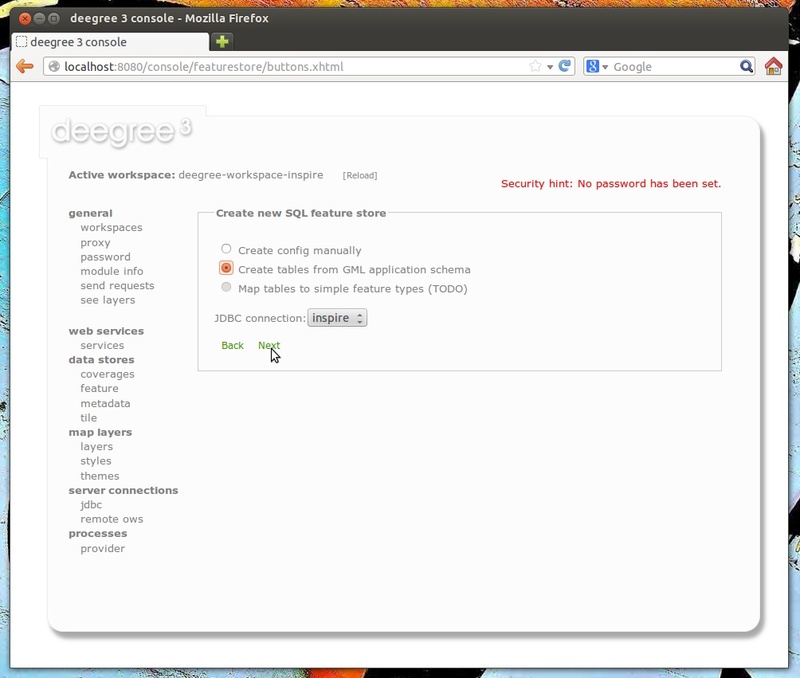 from WFS GetFeature requests or when accessed by the WMS) to SQL-WHERE conditions. However, this is not always possible. Sometimes a filter uses an expression that just can not be mapped to an equivalent SQL-WHERE clause. For example when using BLOB mapping and the filter is not based on a feature id or a spatial constraint. In such cases, the SQL feature store falls back to in-memory filtering. It will reconstruct feature by feature from the database and evaluate the filter in memory. If the filter matches, it will be included in the result feature stream. If not, it is skipped. The downside of this strategy is that it can put a serious load on your server. If you want to turn off in-memory filtering completely, use <DisablePostFiltering>. If this option is specified and a filter requires in-memory filtering, the query will be rejected. Although this functionality is still in beta stage, the services console can be used to automatically derive an SQL feature store configuration and set up tables from an existing GML application schema. If you don’t have an existing database structure that you want to use, you can use this option to create a working database set up very quickly. And even if you have an existing database you need to map manually, this functionality can be prove very helpful to generate a valid mapping configuration to start with. As every (optional) attribute and element will be considered in the mapping, you may easily end up with hundreds of tables or columns. This walkthrough is based on the INSPIRE Annex I schemas, but you should be able to use these instructions with other GML application schemas as well. Make sure that the INSPIRE workspace has been downloaded and activated as described in Example workspace 1: INSPIRE Network Services. 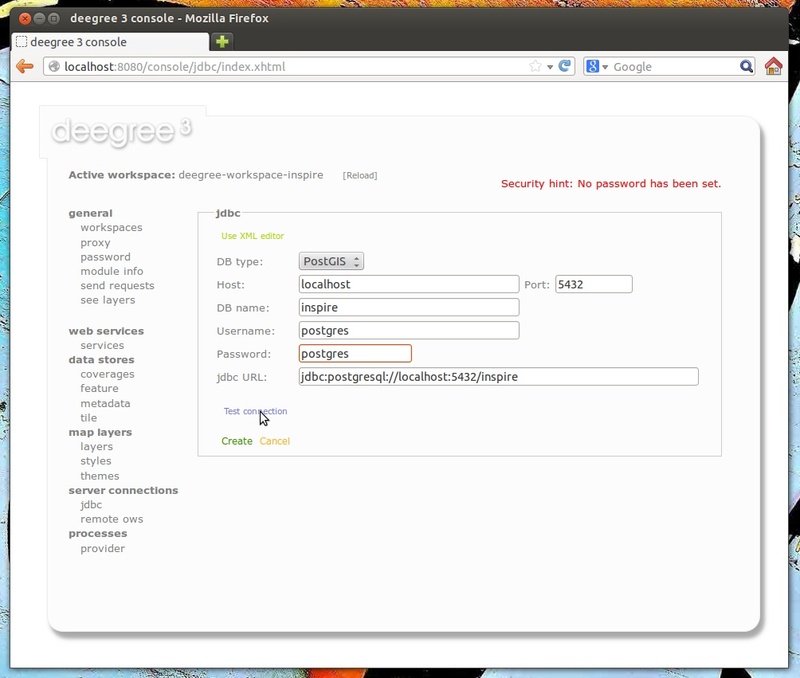 As another prerequisite, you will have to create an empty, spatially-enabled PostGIS database that you can connect to from your deegree installation. Instead of PostGIS, you can also use an Oracle Spatial or an Microsoft SQL Server database. In order to enable support for these databases, see Adding database modules. 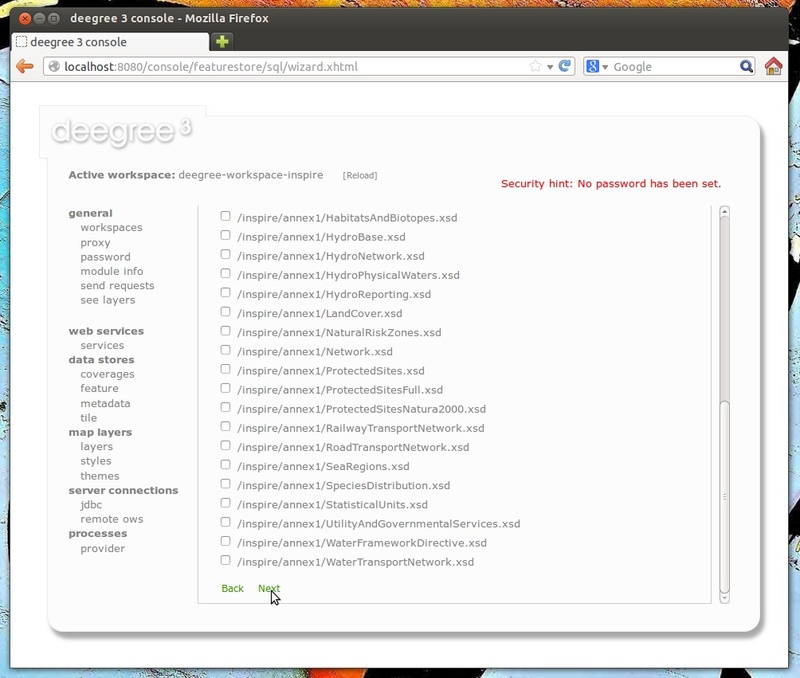 This view presents any .xsd files that are located below the appschemas/ directory of your deegree workspace. If you want to map any other GML application schema (such as GeoSciML or CityGML), place a copy of the application schema files into the appschemas/ directory (using your favorite method, e.g. 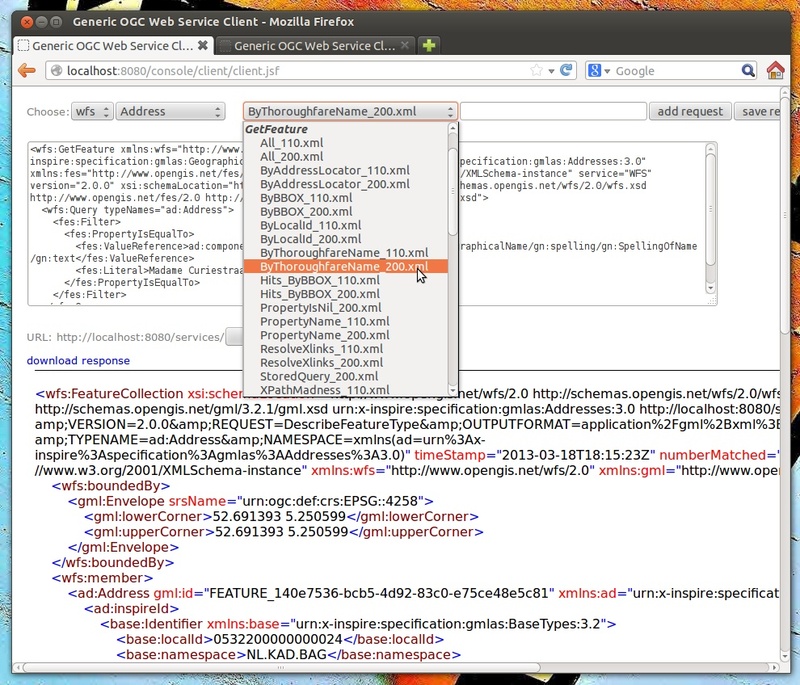 a file browser) and click Rescan. You should now have the option to select the files of this application schema in the services console view. The above URLs are for a UNIX system with a user named “kelvin”. You will need to adapt the URLs to match the location of your workspace directory.